The Carlisle 4004102 Sparta® Spectrum® tank and kettle brush’s flare head design ensures surfaces are fully cleaned. 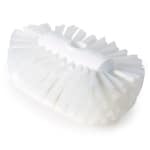 Its crimped polyester bristles are securely stapled to the sturdy plastic block and maintain their shape after heavy use. This brush is compatible with various handles, so it can clean a wide range of surfaces.